For laparoscopic transabdominal preperitoneal (TAPP) hernia repair prosthetic mesh reinforcement is used. Mesh fixation devices should prevent recurrences, but they can cause considerable chronic pain. 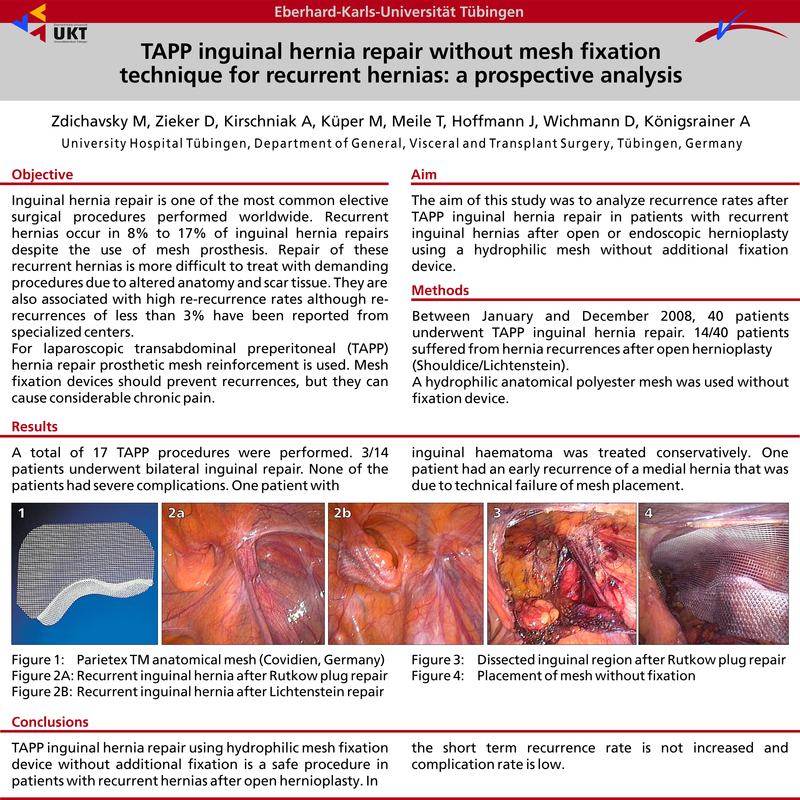 The aim of this study was to analyze the recurrence rate after TAPP inguinal hernia repair in patients with hernia recurrences after open hernioplasty in the past, using a hydrophilic mesh without additional fixation device. Between January and December 2008, 40 patients underwent TAPP inguinal hernia repair. 14/40 patients suffered from hernia recurrences after open hernioplasty. Mean age of males (n=13) was 56.0 years and females (n=1) 75.0 years. 2/14 patients were ASA 1 and 12/14 patients ASA 2. A hydrophilic anatomical polyester mesh was used without fixation device. A total of 17 TAPP procedures were performed, 3/14 patients underwent bilateral inguinal repair. None of the patients had severe complications; one patient with inguinal haematoma was treated conservatively. One patient had an early recurrence of a medial hernia that was due to technical failure of mesh placement. TAPP inguinal hernia repair using a hydrophilic mesh without fixation is a safe procedure even in patients with recurrent hernias after open hernioplasty. In the short term recurrence rate is not increased and complication rate is low.